The enterprising Neave Trio (Anna Wiliams, violin; Mikhail Veselov, cello; Eri Nakamura, piano) brought music by four female composers from the 19th, 20th, and 21st centuries to the Pickman Concert Hall of the Longy School, where they are in residence when not touring. The concert from March 15th bore the intriguing title “1.8 Percent,” a reference to a survey taken several years ago by the Baltimore Symphony to determine what part women composers contributed to the annual selections of America’s orchestras. Orchestral performances, though, reflect a generally more conservative taste. Moreover, the situation is changing, though not as quickly as one would like. And in any case, the program we heard registered 100% on the scale. In the late 19th century, when composers like Cecile Chaminade and Amy Beach began to be heard with increasing frequency, there was a great deal of discussion in the press of whether women could be expected to write “strong” music, or to work in “major” forms like the symphony and the concerto. Women had been writing and even publishing music for a good part of the century, but the majority of their works were in the form of miniatures, art songs and piano pieces—music for the parlor, the natural domain of women, it was asserted. Neave provisioned four larger works designed for the concert hall, not the drawing room. Moreover none of these seem devoid of “strong” musical gestures, nor do they necessarily suggest a woman’s touch, despite the way that the two earliest composers on the program felt the weight of reviews influenced by what today is called “sexual aesthetics,” which takes lyrical and charming pieces to be “too feminine,” while larger-scale works emphasizing abstract structure and thematic development were “too virile” and unsuited to being composed by a woman. Cecile Chaminade (1857-1944) had her first piano lessons from her mother. She studied privately with leading piano teachers at the Paris Conservatoire (he father did not want her to enroll as a regular student there. But already in her early twenties she began composing seriously. The Piano Trio No. 1, Opus 11, was published in 1881, the same year as an orchestral suite and just before the (private) performance of a comic opera. The opening Allegro begins darkly, but yields to a richly melodic second theme. The play of harmonic changes and of major and minor covers a range of moods, light to vigorous. The cello introduces the Andante with a pensive theme picked by the violin; the two strings intertwine while the piano for the most partly provides support. Several climaxes offer an arch shape before the tranquil close. The Presto is a brilliant scherzo dominated by virtuosic running figures in the piano, against which the strings bring in a sunny swinging waltz, with plays of two-against-three occasionally varying the flow. 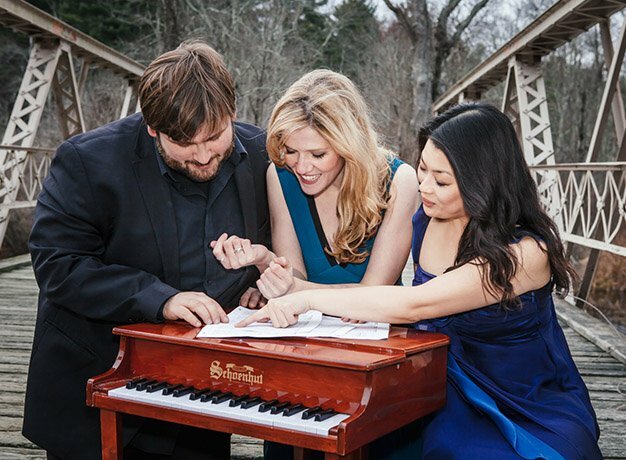 The final Allegro molto sends all three players on a madcap race, with occasional moments of relaxation, but building to strong emphatic assertions making for a strong closing for all three instruments. Throughout, pianist Eri Nakamura paces the fast parts and maintains a counterpart to the strings’ songful music together. Though Amy Beach (1867-1944) lived at almost the same time as Chaminade, her Piano Trio in A minor, Opus 150, cames very late in her career (1938) in contrast to Chaminade’s, nearly 60 years earlier. The harmonies take on a chromatic tinge. As with Chaminade, the piano plays a particularly significant role (both composers were leading pianists), but Beach takes her pensive opening gestures, which quickly involves all three players, to a dynamic climax After it sinks to its hushed ending, the music continues almost without pause in the Lento espressivo, which suddenly turns into the playful fast section with all three players taking joyous part. Generally the violin and cello are paired against the piano’s dance. The Lento returns to close out the movement. The Allegro con brio is marked by rhythmic chords in the piano during which all three instruments set up syncopated figures that are among the most “modern” passages in the piece. The Beach Trio gives the effect of being a single movement running about 16 minutes, with subdivisions that run contrastingly into one another. The Neave Trio fits the pieces elegantly together in ensemble and color, with expressive moods taking in the expressive cantilena to the light smile brought in by the syncopated passages. Rebecca Clarke (1886-1979), a professional violist born in London, spent much of her life in the United States and died in New York. Her fame as a composer began to be established when she offered a viola sonata for the competition of the Berkshire Festival of Chamber Music established by the patron Elizabeth Sprague Coolidge. At the 1919 competition, the judges were unable to decide between two viola sonatas (submitted anonymously, as required) and eventually decided to award the prize to both. Imagine the surprise consternation upon the revealation that one of the winners was Ernest Bloch, already developing a strong early reputation (the BSO had premiered his Scholomo about a year earlier), but the other winner was a woman! A similar experience came two years later, when she entered her Piano Trio in the same festival, winning again. The work was distinctly on the modern side for 1921, when it revealed, as the Viola Sonata had done, that abided in a musical world in which Fauré, Debussy, and even Stravinsky existed. The opening Moderato ma appassionato begins thunderously in the piano, followed by a rising dark figure in the cello. Figures with repeated notes or chords were tossed about, sometimes very fast, sometime slowly. Following the earlier pieces, generally evoking late romatnticism, the Neave players became sterner and more driven here. The slow movement, Poco lento e molto semplice, unfolds with delicate string passages in a quasi-folksong style, over rocking figures in the piano. Here the delicacy of the playing offered a splendid contrast to the aggressive sonorities of the previous movement. The closing Allegro vigoroso brings a touch almost of comedy by way of syncopation to its “vigor.” Here Anna Williams and Mikhail Veselov reinforced one another superbly against the pounding and dancing of Eri Nakamura’s piano. At this point I should mention that the concert included colorful images projected on the wall behind the performers, especially created and timed for these pieces by Andrew Ringler and Bing Lin. In general, I find such images distracting and, at the least, unnecessary. But I did find the images created for the last work on the program, Jennifer Higdon’s Piano Trio of 2003, to work effectively. This was largely because she gave color titles to the two contrasting movements of her piece, and the abstract images and colors matched well. Higdon suggested the kind of music we would hear with her contrasted titles: Pale Yellow and Fiery Red. The first movement struck me as suggesting the world of the Aaron Copland of Appalachina Spring—not that it was in any way imitative, but because she used a “white-key” sonority throughout, with gently rocking chords in the piano and sweet thematic figures in the strings, the whole evoking a bright, quiet morning. The second movement could not have offered a more striking contrast: At a fiery clip, all three players move in the ensemble of fast scales, trills, and measured tremolos. At one point the strings continue in the tremolos while the pianist plays deep bass notes individually, sounding for the moment like a passage near the end of Musorgsky’s Night on Bald Mountain, before slipping into a hushed passage, still at the devil-may-care clip, that grows into the full force of the fiery red image. This movement gave the Neave Trio an opportunity to astonish with nonstop energy to the close.